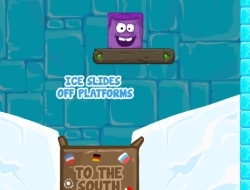 Icy Purple Head is an awesome skill game in which you will need to try your best and hopefully manage to make the purple character fall into the box that is heading south. Your way of doing this is by freezing the box so it will not stick to anything and slide of surfaces. Remember that this sounds easier than it actually is because there will be plenty of obstacles you need to dodge and also lots of objects to interact with that will hopefully help you get to the destination in each of these awesome levels. Help Icy go to warmer places as he is tired of being cold all the time. Icy Purple Head 0.00 between 0 and 10 based on 0 votes.